Bayt Lahiya - Where is Bayt Lahiya Located? One of the Villages/Cities of Gaza District, find here important information and profiles from Bayt Lahiya. Where is Bayt Lahiya Located? 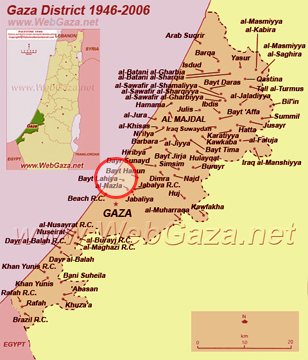 Bayt Lahiya is located in the middle of Gaza District, north of Gaza, southwest of Bayt Hanun, as shown on the map. Seven kilometers north-west of Gaza, on the right of the road leading to Gaza City, is the village of Beit Lahya, 1015 inhabitants. Beit Lahya, or ancient Bethelea, is situated about 4km from the coast in a valley surrounded by sand dunes. The railroad which used to connect Cairo to Haifa, passes through the village; this railroad was stopped after the 1967 War.